i found a small cast iron pan in the broiler part of the oven. i was thinking about selling it on a website to get more out of it then scrap. i would say it is 6lbs so thats got to be what 30 cents in scrap? any ideas on what i should mark it for? its also got lines on the pan part to make grill marks? This might better for garage sales than ebay. Brand new grill pans on ebay start as low as $15. So unless it's really big you prolly better to sell via offerup or something and save on the shipping. But as general practice, to gauge the ebay selling price, search for the item on ebay. Then scroll down on the left hand side and click "sold items". That'll tell you what people actually sell it for. thanks yes i use offer up. 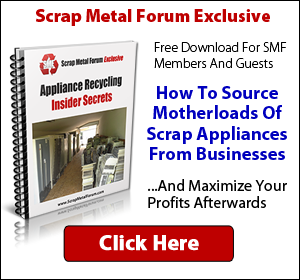 There's certainly a market for them that's better than scrap. It also sort of depends if its an older known brand versus some newer Chicom knock-off. A little research on it will help out. its a calphalon it was hard to read. Have you ever found $ in an item u scrapped?